Documentary revolves around actor’s 2014 return to the boxing ring in Moscow. 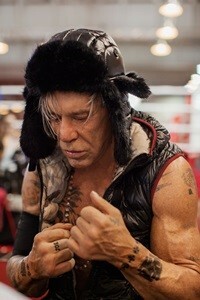 Paris-based sales company Versatile has acquired world sales rights to French photographer and director Richard Aujard’s bio-doc Guapo Siempre, a portrait of Mickey Rourke’s return to the boxing ring in Moscow in 2014. The film, which is in post-production, follows actor and retired boxer Rourke as he prepares at the age of 62 to take on a fighter half his age in a special boxing exhibition in the Russian capital, after a 20-year absence from the ring. A few days before the fight, Rourke’s beloved dog Guapo dies, plunging the boxer into a mystical state for his comeback fight. Aujard, who is a long-time acquaintance of Rourke, captures the actor-boxer as he looks back over his life and career. Aujard is best known at home and internationally for his photography work focusing on the world of sport and celebrity as well as world cultures, including Native American tribes and the Charro horsemen in Mexico. Paris-based Bonne Pioche Cinéma, which also worked on March Of The Penguins, The Fox And The Child and Once Upon A Forest, is producing the documentary with Cantos Bros Productions, the Marseilles-based production company of footballer-turned-actor Eric Cantona and his brothers Jean-Marie and Joël. Other titles on Versatile’s Cannes slate will include Australian director Chris Peckover’s suburbia-set home invasion horror-thriller Safe Neighborhood, for which it will show a first trailer.